Location: Almost opposite entrance to Cardiff Castle. Replica, circa 1938, of front of former Angel Hotel. The original building may have dated from as early as 1780, and it has been suggested that it may have been by Henry Holland, who worked at the Castle at that period. During rebuilding in 1930s by Mount Stuart Estates, the front colapsed and was rebuilt in replica; a late C19 shop at the L end was rebuilt in classical style to match. C18 style front in smooth render; parapet and cornice. Three storeys. Generally metal casement glazing with glazing bars. To east (L), block with 2 small windows on second floor; Venetian window on 1st floor; 4 round-headed shop windows on ground-floor. Main block of 5 bays; 4 square windows on second floor. On first floor, 5 windows, outer windows set in round-headed arches, centre window recessed within tall arch which rises to attic level. On ground floor, rectangular doorway in centre. To either side, 2 round-headed shop windows. To east of this, a bay with cornice and parapet at same height; 1 window on both first and second floors; 2 round-headed shop windows on ground floor. Lobby with plate glass shop windows to each side. To rear, in circular top-lit hall, elegant 1930s style cantilevered spiral stair with solid rendered parapet; bronze handrail with "M" (for Mount Stuart) monogram. A careful 1930s replica of important Georgian building on key site opposite Cardiff Castle. Elegant 1930s staircase. 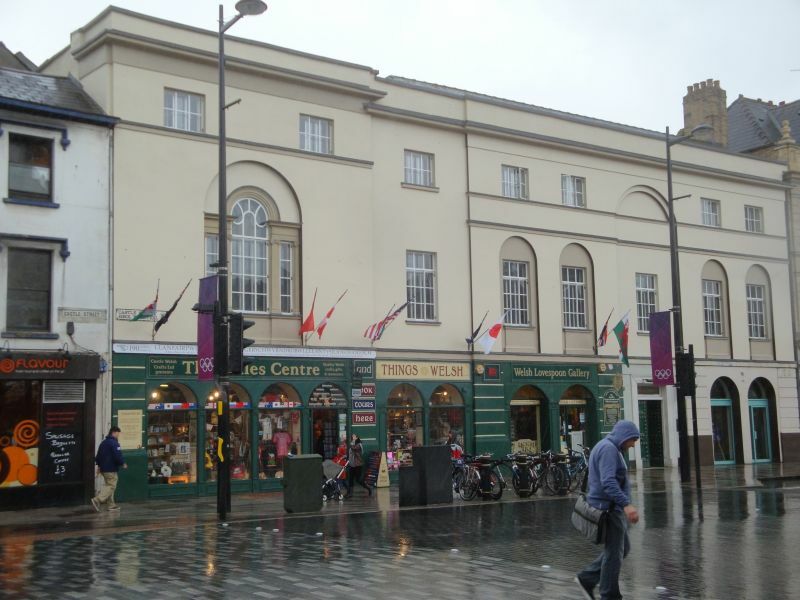 L-plan arcade with entrances in Castle Street (opposite entrance to Castle) and High Street (opposite High Street Arcade). About 20m S of junction with Duke Street. To R of No 5, stepped up.